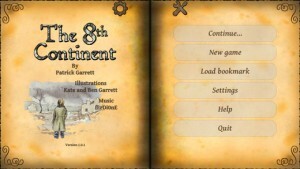 The 8th Continent, a gamebook app programmed by Ben Garrett, written by Patrick Garret and illustrated by Kate and Ben Garrett (this is one creative family!) tells the story of Morgan, a teenager who has to survive and find his family after a super-eruption destroyed the world as we know it. A post-apocalyptic adventure gamebook, that tries to make some interesting innovations in the media. The post-apocalyptic fiction is a subgenre of science fiction with a long history. The subgenre became popular in the eighties, with the nuclear fear of the Cold War, but we can find it as early as Mary Shelley‘s “The Last Man” in 1826. And even earlier, if we consider the Book of Revelation, or the story of the great flood and Noah’s ark in the Bible. These stories, which usually narrate the destruction and rebirth of our world, become more popular in times of great social and political crisis. “The Last Man“, by Mary Shelley, talked about the failure of romantic political ideas. During the Great Depression in the 30s, novels like Stephen Vincent Benét‘s “By the waters of Babylon” described the ruins of the United States after a “great burning”. The Cold War brought, of course, hundreds of examples, born with the fear of global annihilation by nuclear weapons. And, after the fall of Lehman Brothers and the beginning of our current global systemic crisis, it’s no wonder that post-apocalypse becomes popular again. Usually in the form of the “zombie-apocalypse”, but also in more creative ways, like the “super-eruption” described in this story. As we mentioned before, in this story we take the role of a teenager called Morgan, a guy who witnesses the destruction of his city one morning, and is forced to hide with his family inside a bunker. After this is narrated in the first chapter, we are told how Morgan’s family is taken away by a group of mysterious kidnappers. And, as it is mandatory in any adventure story, he decides to go looking for the kidnappers and save his family from them. “8th Continent” tries to do some very interesting things with the gamebook media on mobile phones, by giving it more of a “game-y” feel. Placed among the narrative, there are three kinds of games, that appear whenever a specific situation arises. Whenever our character wants to search for objects, we arrive to a “Scavenging” game, basically a “match-three puzzle” kind of game. Whenever we have to force an electronic lock, it’s time for a “Hacking” game (a puzzle game similar to the old “Pipe Mania“). And even when we have to fight an adversary, we are taken to a “Fighting” game. The result of these experiments is mixed. I think it’s interesting to try new ways to add interactivity to gamebook apps, and even to mix computer game mechanics with narrative. Still, the “scavenging” and “hacking” games, even if they are fun to play, don’t feel part of the overall story. When we are searching for medicines inside the ruins of a house, and suddenly we have to play a “candy crush” clone… well, it feels as if we were playing a different game altogether. 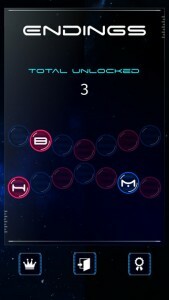 The “fighting” game, though, is a fantastic idea, very well executed. Instead of the random dice rolls we usually find in these kind of stories, here there is some strategy to the confrontations, in the form of a card game, where we exchange attacks and defences with our enemies, trying to eliminate them while minimising the damage we receive. 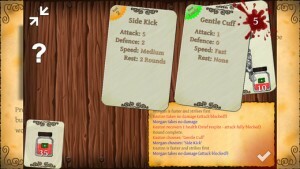 Those “combat cards” are also much better interlaced with the narrative, as we obtain them when we discover weaknesses in some of our enemies, or when we use the environment to our benefit. There is a fourth kind of game, a completely optional “decoding” game where we decrypt the entries of our father’s journal. This won’t give us any benefit in the story, but will add some interesting additional background information. I am leaving the best part for the end. The writing of this gamebook is fantastic. It really manages to make us feel that the world being described in the story is real, the world is alive, and even the characters are believable. Here we won’t find “good” or “bad” characters, just people struggling to stay alive. Also, some of the descriptions in “8th Continent” are the most beautiful that I’ve read in any gamebook. Patrick Garrett is a very talented new writer, and I can only encourage him to keep writing. As a gamebook, it tends to be a bit more linear than many (as one of the archievements, “Completionist”, says, it is possible to read the vast majority of pages in a single playthrough), but I am sure issues like these will be fixed in future entries of this series. I’ve liked “8th Continent” a lot. A good gamebook, not without problems, but excellently written, and a story that I will love to see continued. This is a guest post by Borislav Traykov – currently a member of the Gamebooks group in Facebook, looking forward to start his own blog about gamebooks. I would like to feature Sturmberg – the first and titular short gamebook from the 3rd “Hero: The Calling!” collection of short gamebooks. You can read a bit more about the series in general and a short introductions to each gamebook on the blog post dedicated to the series. For this post I wish to translate the reviews on Sturmberg from the book’s page on GoodReads.com. In the first short gamebook in the collection you are a young doctor in the remote little village of Sturmberg in the vicinity of Weimar, Germany. A series of brutal murders committed in one night will force you to do a hasty investigation and find the culprit. Out of the three stories in the collection, this one offers the most interactivity. The mechanics of the game are like a well-oiled machine, ticking without a hitch. 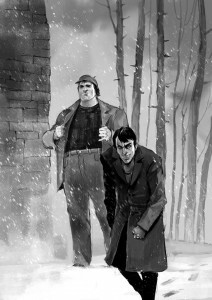 During the investigation around the village the reader finds various evidence pointing to the culprit of the crimes. At the end you have the opportunity to lay down your findings and make conclusions based on them to the rest of the villagers and to do what must be done. The combinations of evidence vary and can lead you to several different endings. There are at least 7-8 ways of finishing the gamebook thanks to the diverse evidence materials which you find at your disposal. However, only one of those endings is the true and satisfactory one. I did not tire until I reached it. The tangled mystery from the beginning of the story gave me hopes for a grand finale, but things turned out to be simpler than I expected. Kudos to Sycamore Bright for piecing the different elements of the story. He has put in a lot of effort for sure in order to make this gamebook enjoyable. The story begins on a winter evening somewhere in a remote German village with you taking the role of Doctor Thomas Eisenhoff, who at that time is drinking wine in front of the fireplace – sweet! Your fun however is about to be spoiled because someone is killing village people on this evening. Who and why – you will have to uncover the answers to these questions yourself amidst the chill of the night, the blizzard, the clues and the blood on the snow … a wonderful crime story which I liked a lot. The atmosphere of the story is superb. I got that oppressive impression of a cold dreary winter evening that has gripped the small German village of Sturmberg, tucked away in the forests. Everybody here thinks that they know everyone else well … or so they think. Everyone has secrets here. The protagonist may try to play the part of the big hero, but he is really just an academic – a doctor with unenviable physique. Only his resourcefulness and reason can help him. I honestly admit that during the first and second playthrough, my guesses and clues just about turned up to be correct … and it was on the third play-through that I managed to actually reach the true ending. As a reader-player, I was very pleased – each one of my attempts was building on top of the previous ones as I was learning from my mistakes during each playthrough. 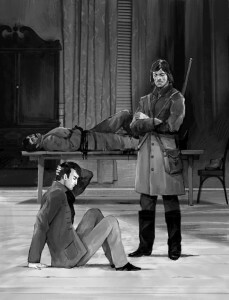 The only weakness of Sturmberg for me was the protagonist – apart from being a doctor with some refinement, appropriate for the time and place, I could not feel neither his anxiety for being in that situation, nor his trepidation for seeing a whole string of murders. Last, but not least, I couldn’t feel his confusion at the fact that the uneventful and dull life in the village was just an illusion – a thin sheet of ice with deep and murky waters beneath it. The rest of the characters in the gamebook appealed to me though – their actions and reactions were believable and held my interest. A cool crime investigation with an amateur in the lead. 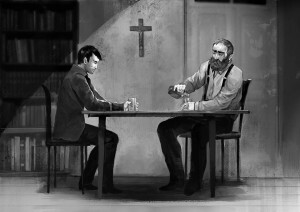 “The way down” is a secret bonus short story – no gameplay – that can be unlocked only by reaching Sturmberg’s true ending. In short, it contributes to answer a few questions that were left unaccounted for, and gives a peek of a few more interesting characters. Finally, the short story bears a worldly moral about greed and avarice. At the end of this guest post, I would like to mention that Sturmberg is the only gamebook in the third “Hero: The Calling” series that has its own illustrations. They are the work of the talented Bulgarian digital artist Svetoslav Petrov. The translation of the name of the book is purely my own interpretation – I have not checked it with the guys who have published the book. In this post I am going to do something quite different. 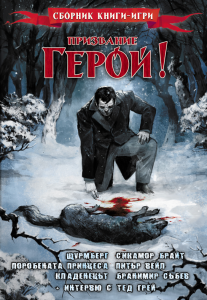 Borislav Traykov, a member of the Bulgarian gamebook community (and member of the Gamebooks group in Facebook as well), also looking forward to starting his own blog about gamebooks, has offered me to review three titles in a popular bulgarian series. Take into account that this series has not been translated into english, and – unless some american or english publisher gets interested – it probably will never be. It is not very often when we have the opportunity to get a glimpse of what’s being done in a community as rich and interesting as the one in Bulgaria, so here it is, for the enjoyment of those like me who want to know more about all things interactive fiction! This article will work as an introduction and an index of this series of articles, and during the next weeks I will be updating it with the links to the other three articles. I would like to feature the 3rd “Hero: The Calling!” collection of short gamebooks. “Hero: The Calling!” (it’s pronounced as “Prizvanye: Gheroi!” – just use Google Translate’s English vocal to hear it) is an ongoing series of collected short gamebooks. Three collections have been published so far – each one being bigger, in terms of pages and thus content, than the previous! As with the previous two collections, all stories are from Bulgarian authors. The series is produced by the Bulgarian gamebook community. Their website is http://knigi-igri.bg (literally “books-games”). Unfortunately it’s available only in Bulgarian. For this post I wish to translate the short introduction to each of the three gamebooks in the collection – the original text and front cover are taken from the book’s page on GoodReads.com. The Enslaved Princess, by Peter Veil (or Vale) – 1236: the same year when the Bulgarian tsar Ivan Assen The 2nd frees Constantinople, on the Iberian peninsula, a state which has survived for five centuries is waning. The breathtakingly beautiful Arabian princess Sheila is taken prisoner by French crusaders. Can a young girl find the courage and ingenuity to break free from her captors? The Well, by Branimir Sabev – Sometimes Evil is closer to us than we expect. A thirteen-year-old boy will have to go through a literal Hell, which is filled with traps and nightmarish creatures, in order to free his little sister. It’s worth noting that the last gamebook, The Well, got second place at the National Sci-Fi & Fantasy Awards in the category “Best gamebook” for 2014. Finally, the book contains an interview with one of the authors from the “old school” of gamebooks in Bulgaria – Ted Gray. Coming soon, I will share translations of the Goodreads reviews on each gamebook in the collection. I have not asked the author of The Enslaved Princess about the actual translation of his nickname – it’s either Vale or Veil. 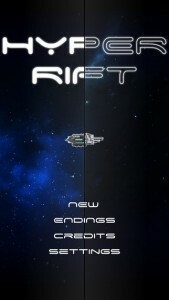 Hyper Rift, a game by the small developer CKS Studio, is an interesting mix between a graphic adventure and a gamebook. In this story, we wake up with no memory of our past in the medical bay of a spaceship. During our investigation, we will discover the alien threat in the ship and its sinister past. This game tries to do some very interesting things with the gamebook media. 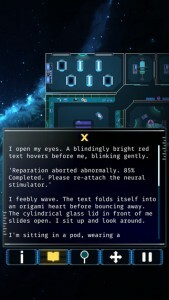 Even if it is a text-heavy game, the way we navigate this space ship is through a graphical map, clicking at the objects in the room we want to interact with. 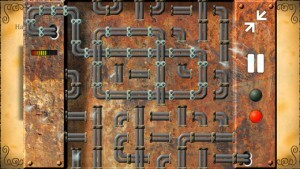 Also, it has a lot more puzzles than your average gamebook, giving it more of a graphical-adventure feel. Considering also that it nominally deals with two of my favourite themes – sci-fi and horror – this game has everything on the paper to be a gamebook I’d greatly enjoy. Still… it fell short of my expectations. I must say, much to my embarassement, that I haven’t been able to finish this game. I always try to reach the end of any game I review, but even if I spent three weeks trying to break some of its hardest puzzles, I finally admitted defeat. This game is hard, which is not necessarily something bad in my book. But the more time I spent with it, the more conscious I was of its flaws. To begin with, the story isn’t capable of maintaining the feeling of fear and menace that it aims for. The aliens are not common or dangerous enough to make you feel like you could die at any moment. Add to it the many humorous scenes and characters -so shallow they seemed just excuses to have their names on the sheet-, that may want to lighten the mood of the story every once in a while, but break immersion instead, changing the tone of the story too abruptly. The result is a game that doesn’t quite achieve that “Alien” or “Event Horizon” feel it is looking for. Also, it has the problem of many graphical adventures; since we can move freely through the map of the space ship, and we have to use objects from one room to another, once we have discovered every place, we will still have to do a lot of backtracking; going back and forth from floor to floor, looking for that elusive object or clue that will make us move the story forward. It ends up being more frustrating than fun. After reading all I have written so far, it may seem that I loathe this game, and I don’t want to give that impression. It is an interesting story, that tries to experiment with new mechanics, and I can only commend CKS Studio for it. Also, the background story of this ship is interesting once you get to understand what really happened. I think it just fell short of my expectations. But I certanly would want them to try again in this direction in future products; I can see there are ideas worth exploring in this game, and a competent writer in these texts, that may only need another try to “get it right”, both as a story and as a game. In any case, considering that this is a free game, there is not much risk in giving it a go, right? You can find it HERE (for Android) or HERE (for iOS). 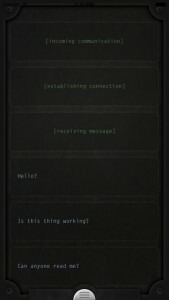 In “Lifeline“, by 3 Minute Games, we receive a mysterious transmission from an astronaut in distress. In this game, our objective will be to guide him appropiately in order to ensure his survival in an unknown planet. The evolution of gamebooks in mobile phones has been quite interesting. At first, appealing to the nostalgia of those who were raised with the media, they attempted to recreate the exact same experience as the physical book, with companies like Tin Man Games, who try to replicate even the dice rolls over the book pages. 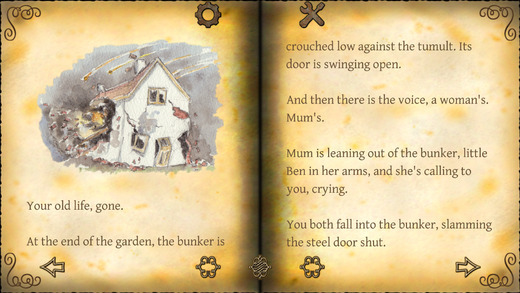 Later, as a result of the appearance of other companies like “Inkle“, a serious investigation on the additional narrative possibilities of this format was started, thus gamebooks like the mobile phone adaptation of the “Sorcery” saga appeared, where the story is carried out in a 3D world we can traverse freely. Although all these new directions interest me as a player, there is something about the appearance of mobile phones and the development of gamebooks in this format that make me fear the reduction of the literary part. Text, as a mechanism for the generation of ideas, may be suffocated in the middle of 3D maps and state of the art graphics and sound. There is something very powerful about images, that make our gaze wander towards a tv screen in a restaurant and lose track of the conversation. The seduction of text is slower, it requires an effort that images don’t need, hence the charm of images is more immediate, more brutal, and can endanger the “book” part of a gamebook. Nevertheless… “Sorcery” is wonderful. The possibilities of mobile platforms open a whole new world in the narrative sphere. How to take advantage of them without distracting from the textual part? When I saw “Lifeline“, it appeared as a feasible solution to this dilemma. 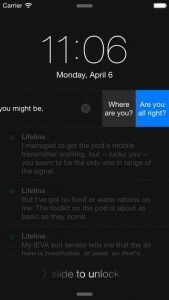 In “Lifeline“, we receive a transmission from an astronaut called Taylor, cadet of the spaceship Varia, and its only survivor. From the very first moment, we can only feel sympathy for the poor guy. A young man, understandably terrified, that has found in us the only contact with humanity. As we talk with him, and help him with his more immediate problems – finding food, a place to sleep… – a believable and likeable personality is revealed, that of a young and scared young guy, who jokes in order to downplay the gravity of his situation, and strikes up a conversation when loneliness weighs him down. 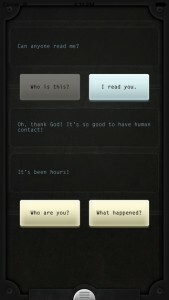 “Lifeline” has a strictly textual interface. Only the speech of this astronaut, with no graphics or sound apart from the soundtrack. And every once in a while, a choice point with exactly two choices, that we will use to point him to his best options for survival. That said, it may sound as your average CYOA game, but there is a feature that changes significantly the game experience: the story proceeds in real time, during three days. We cannot “continue” whenever we want. At a given point, we may advise Taylor to go to the ruins of a spaceship, and during the next hour, Taylor cuts the communication and promises to notify us when he reaches his destination. Later (while we continue our boring normal life, shopping or bearing our boss), a notification arrives in our mobile phone; Taylor has arrived at the new location and needs our help again. There is something very powerful in this kind of interaction. It really gives the feeling that, on the other side of the line, there is someone who needs us, to whom we are the only link to the rest of humanity and live. We really empathize with Taylor, and feel for him when he dies. And finally, when we meet our objective and save his life, we almost regret not being able to have a beer with astronaut Taylor once the danger is over. Definitely, a very interesting experiment, that aims to other kinds of narration with a mobile platform, impossible to replicate with a book, but keeping most of its essence. And a mistery, that of spaceship Varia and the mysterious planet, that is worth uncovering. 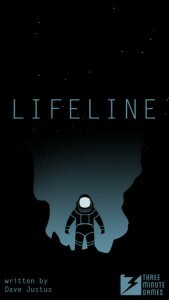 I will want more stories like “Lifeline” in the future. Verdigris Tales, by Three Trolls, Inc.
Verdigris Tales, a game by Joao Geada and Andy Kirschbaum, leads us to the city of Railhead, in a steampunk world where magic and science get together, much in the same vein as the city of New Crobuzon in China Mieville‘s “Perdido Street Station“. One of the reasons that made me review this game was the little relevance it’s had since its appearance in 2011. Four years later, the number of downloads of the Android version is between 1000 and 5000, and the number of commentaries of the iOS version doesn’t make us hope for a bigger success. The reasons for this are obvious; lack of interest from their makers to promote the product they had made. Except for an article in a local newspaper of the city of Chelmsford, I haven’t been able to find a single commentary or review of this game, and the website of this product is so poor in content that gives by itself an idea of the scant media campaign that has been done for this work. 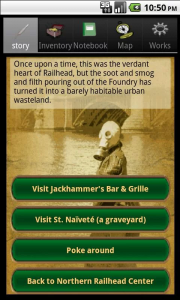 And it’s a pity since, as we’ll see, Verdigris Tales is a gamebook with some very interesting features. Airships fly over the great cities, mechanical workers known as automatons are a growing source of labor, and the Great War that looms on the horizon will be fought with war walkers and death rays. That’s how Verdigris Tales gets started, a gamebook where we take the role of the son/daughter (we can select the gender) of a nobleman from the First World and an entrepreneur from the Second World. Thirsty of adventures, we decide to travel to another continent in order to visit other lands. And there we settle in the city of Railhead, where our business as a private investigator gets started. 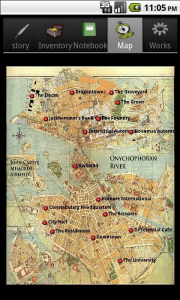 As we can see, the setting is a great city in a Steampunk world, where the great steam machines and the analytical engines get mixed with the world of magic and occult. There isn’t a story as such, but the description of a setting – the city – tremendously rich and full of nuances. The “story”, in the form of several missions that we’ll keep solving in our work as an investigator, is just an excuse to show all the many aspects of this world. We will find corporate conspiracies, machines that reach self-consciousness, zombies, an underground city and many other small stories, wonderfully narrated. And that is another of the virtues in Verdigris; the prose of Andy Kirschbaum, a writer with other two novels published, is agile and full of irony, capable of describing a complex world in just a few strokes, and make us laugh at the same time with the adventures of our foppish protagonist. Structurally, this is also an atypical gamebook. We can solve the missions in any order, and move with complete freedom all over the city. And, at the same time, mission after mission, we will discover an overarching plot about the conspiracy of a powerful organization, the New Order, that will only be fully revealed at the end of this adventure. To sum up, Verdigris Tales is a good story. Or even better, a good heap of stories, that will give us a taste of a rich and complex world that deserves to be explored even more. 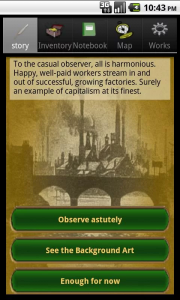 A game, Verdigris Tales, that deserves much more attention than it’s got.